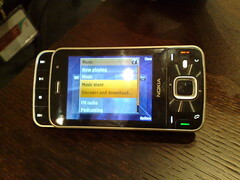 Along side the announcement of the Nokia N96, the Nokia N78 was released. This phone is essentially the successor to the popular Nokia N73. It is enhanced with Wi-Fi, AGPS, FP2, FM Transmitter, and other software tweaks. The design is clean and simple, and except for the keypad, the buttons are well-spaced. In contrast in what I initially perceived, the softkeys are easy to press for the most part. The keypad feel is similar to the N82, so if you don't like that keypad, you probably won't like this keypad as well. I'm some what used to the N82, so that's no big problem for me. Like the N96, this phone is a fingerprint magnet. My rant on the N96 also applies to this phone as well, that is I wished that the multimedia button could be mapped for any application or process the user would specify. With all this in mind, I still think it's a worthy phone in its own right, and I would definitely love to give this phone a full spin as it becomes available. The cream of the crop of this year's announcement from Nokia is the Nokia N96, dubbed the "supercharged N95" depending on how you view it. Of course before the formal announcement everybody pretty much knew what this phone was all about. I know this is late, but I've had other stuff riding on my back the recent days, so here it goes. It came out to be an interesting morning here in the west coast, staying up until 6 am on the 14th chatting with three Nokia N82 Product Managers, the bloggers who had access to the phone, and the rest of us including bloggers and general audience curiously asking questions. Ricky has got the important Q&A covered, however I'd like to point out some other questions that were answered. 2nd. As of right now there is no plan to introduce U.S. 3G, let alone putting in a tri-band 3G chip anytime soon. 3rd. Based on his hands experience, Stefan mentioned that the camera load time has been significantly reduced. There is also a graph on AAS with the exact details. The blogosphere is rattling with news and reviews, so I'll include links here as much possible. Enjoy! Honestly, news of the announcement of the N810 internet tablet with the addition of integrated GPS and a physical keyboard has got me excited a bit. However it's not out yet and only a select few from the blogosphere have got their hands on it. 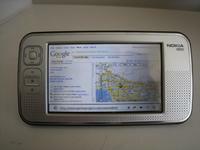 So what happens when I can't wait (read get) for the N810? Settle for the next best thing, the N800. I've played with one for only a couple of minutes about a month ago at an event sponsored by SMS Text News and WOMWorld. I'm fairly intrigued on how this device operates. It's intuitive for the most part, just different names for different functions compared to Windows. I've already tested Gizmo Project making international calls, and it seemed that the other side had an easy time hearing me as I did hearing them. To be honest the interface on Gizmo is better than the PC client. The only bug that I can note is that the web browser has crashed a couple of times. Right now I'm looking into tips on how to get the most of out it, and also looking for a freeware mapping software that supports bluetooth GPS. I'll keep you posted if I come across any interesting uses for this tablet. The N82 is Around the Corner... Is It Welcomed? The N82, what I call being the alternate (or parallel) flagship device besides the next gen. N95, has had its pictures leaked by a guy in Dubai or somewhere in the Emirates and was first posted by Teo (aka Apocalypso). Although knowledge of its existence is almost ancient by technology definition (say May), nonetheless these leaked photos settle the hearts of skeptics. On the other hand there is a countdown for a release in less than 5 days. Of course on HowardForums you can see how this phone has polarized opinions, more like a love-hate relationship, and I encourage you to follow up there as well. What do I think about this phone? On paper there are a lot of great things about it, and things not so great. I'll just countdown the ones that matter for the most part. 1. Xenon flash: With this phone I can stop looking like an idiot trying to take cell phone pics at nights and low level situations. This is supposed to be on par with digital camera flash. Let's hope so. 2. Candy-Bar form factor: No matter how hard Nokia has tried with the N95, it just hasn't got the build quality as good as it should be. The wobbly slider is the biggest problem of them all. There is no need to deal with that issue with the N82. 3. All the enhanced features of the latest gen. Nseries carried over: GPS, abundant RAM, FP1, and all the tweaks are a go on this phone. Design: I wouldn't necessarily call it a con, but I've heard many people thinking this phone is a nod to Sony Ericsson design. Personally I'm neutral about this. 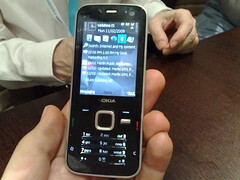 I tried out a SE W880 once which seems it has the same design as the N82. The keypad for me was responsive, so let's hope that the N82 keypad will be easy to use especially for my chunky fingers. Battery: Dear people at Nokia, as if there aren't enough power sucking hardware on board, you've added xenon flash now. Do you think the 1050 mah battery (allegedly) is going to cut it? I hope you agree with me, and try to get back to the drawing boards as fast as you can. Screen size: High-end power users are used to more real estate than 2.4 in. The N73 is 2.4 inch, which was good for it's time, but it doesn't cut it anymore (talk about being spoiled). I have a N95-3 as of this date which is 2.6 in. I thought that a 0.2 in. difference between N95-3 and N95-2 (aka N95 8GB) is insignificant, but when I saw it that theory went down the drain. There is almost no chance that they'll touch that. Deep down I was hoping that they would put a tri-band HSDPA chip, or at least have a NA optimized version of N82, but it's important to remember that the design cycle predates the N95-3's successful launch in NA. Hopefully the statistics that come out from the sales of N95-3 convince the executives and product managers at Nokia to reconsider a 2nd variant for us across the pond. First of all I'd like to give Nokia a huge kudos, they really know how to throw a party, and pay attention to the minor details that make it stand out from an ordinary party. The fine details like the lighting, displays, people, treatment, and overall layout raised the bar I had in mind. Most surprisingly was the numerous people that showed up to the event; people in Nseries development, marketing, bloggers and power users. I was quite baffled by the bloggers and power uses, how most of them had specialized knowledge of a specific segment of Nokia/S60/tablet platforms. The most exciting part of the event that everybody who participated agrees on, was the NETWORKING OPPORTUNITY. I got to put a lot of faces on names, and also got to see new names and faces. This whole experience felt as if a religious gathering for the people there...lol.